Now that they've found their sound, the Tennessee group intensifies their Southern metal and thrash fusion to create their strongest album yet. The Southern metal scene does not often cross paths with the Christian metal world, but there are some bands that choose to embrace both groups, despite their seeming disconnect. The two leading bands in this group are Tennessee's The Showdown and Georgia's Maylene and the Sons of Disaster, and both bands add some modern metal elements into their sound to create a fairly unique blend. However, The Showdown leans more towards the Southern metal side of things than any of their contemporaries; evidenced by their sophomore album, Temptation Come My Way, a straightforward Southern rock mostly devoid of screaming or breakdowns. Their third album, 2008's Back Breaker, achieved an excellent fusion of melodic and aggressive elements, earning them widespread acclaim and recognition for finding their stride. Now back on the scene with Blood in the Gears, The Showdown is out to prove just how diverse and multi-faceted their sound can be. One listen to Blood in the Gears is all it takes to understand why frontman David Bunton refers to The Showdown as "straight-up Tennessee dude metal" at their live shows. This album is jam-packed with thick, meaty guitar riffs and groove-laden drumming by Demon Hunter skinsman Tim "Yogi" Watts (who was only part of The Showdown during the recording of this album). The influences of Pantera and Kyuss are unmistakable in the groove parts of the album, but there are lots of classic thrash and NWOBHM influence as well. The guitar riffs have Iron Maiden gallops in abundance, while the solos are reminiscent of early Metallica and Megadeth in their technicality. With all these influences, one might think that Blood in the Gears would become a chaotic, jumbled mess of parts that doesn't connect. That is not the case at all, though. This album has a masterful flow and very smooth transitions between and within songs. The grouping of faster songs "Heavy Lies the Crown" and "Bring it Down" before the soulful and slow-moving "Take Me Home" is a beautiful exercise in contrast, extended even further moving into the groove-infused title track. And just when it seems like the album has shown every facet of its music, the crooning, heart-felt closing track "Diggin' My Own Grave" comes in and adds a whole new dimension to the sonic palette. This track starts off acoustically, and could have become a full-on country ballad if not for the surprising electric riff that hits at the 1:40 mark, transitioning the song into a metal power ballad until its ending. Delivering such an unexpected, yet immensely potent song is a great way to end an already-strong album. Lyrically, Blood in the Gears departs from the epic battle themes and mythology of Back Breaker, and there is definitely a more obvious spiritual aspect to this album. However, the intensity in Bunton's lyrics enhances the authority and drive of this album to even greater levels. Discussing real-life applications of spirituality and belief in a decidedly anti-religious world, Bunton takes a much harsher approach to the lyrics than most of his contemporaries. Many of the songs criticize worldly excess and irresponsibility, while projecting a bleak future if no changes are made. Clearly, Bunton got some inspiration from Living Sacrifice vocalist Bruce Fitzhugh in the lyrics, as Fitzhugh has always taken a strong stance against societal rejection and condemnation of religion. 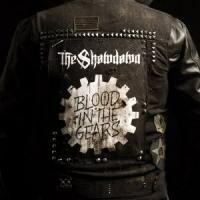 Blood in the Gears will stand as a pinnacle in The Showdown's career because they have both cemented their sound and managed to experiment with new ideas and influences at the same time. It may have taken two albums with completely disparate sounds and a third that combined them to reach this point, but fans of the band can definitely say that it was worth the wait. If Back Breaker was the realization of The Showdown's balance and potential, then Blood in the Gears is the extension and mastery of those two things. From here, they can choose to add new influences or simply strengthen and perfect their existing ones. The sky is the limit now for these Tennessee believers.